It presents a collection of watches TAG Heuer, mobile phones and MERIDIIST LINK, as well as the points – in the general direction of all the products, followed by the famous brand. The symbolic red ribbon, Jean-Christophe Baben cut together with the Russian actress Julia Snigirev, which recently acted as the heroine of environmental charity project “Time rioters”, organized by the watch company TAG Heuer. Opening a new store in Moscow party with guests noted the music of Guru Groov. A little history: Swiss watchmaker TAG Heuer was founded in 1860 and at that time was simply called Heuer – by the name of the creator. Back in 1916 the company has patented a unique clock Mikrograph, able to measure time with astonishing accuracy to 1/100 second. Its present name of the company has acquired only in 1985 when it was bought by the research firm Techniques dAvant Garde (abbreviated TAG). Since its inception, this watch company has created a set of models, which were the innovative breakthrough in the world of timekeeping. 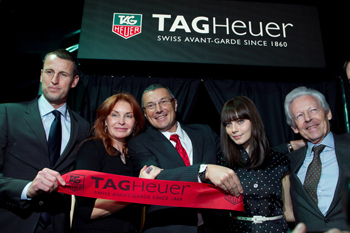 And this is another good reason to look at the new store TAG Heuer, which opened in Stoleshnikov.